…until the rain starts. And doesn’t stop. 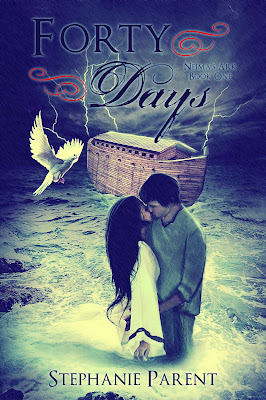 Soon sixteen-year-old Neima finds her entire world transformed, her life and those of the people she loves in peril. Trapped on the ark with her grandfather Noah, the rest of her family, and a noisy, filthy, and hungry assortment of wild animals, will Neima find a way to survive? With lions, tigers, and bears oh my, elephants and flamingos too, along with rivalries and betrayals, a mysterious stowaway, and perhaps even an unexpected romance, Forty Days is not your grandfather’s Noah’s Ark story. Forty Days is approximately 45000 words, the length of a shorter novel, and is the first installment in a two-part epic story. It does contain a cliffhanger ending. Readers looking for a traditional, religiously oriented version of the Noah’s Ark story should be warned that Forty Days may not appeal to them. The novel will, however, appeal to lovers of apocalyptic fiction, historical fiction, and romance, as well as anyone who’s ever dreamed of having a baby elephant as a pet.